Surrounded by gardens, Keys Select Ronil Resort, Goa is just a 5-minute walk from Baga Beach and a 2-minute walk from Titos and Mambos night clubs. It features an outdoor swimming pool, a billiards table and rooms with a balcony. 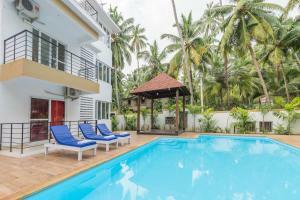 Keys Select Ronil Resort, Goa is 1 km from Calangute Beach and 16 km from Thivim Railway Station. Dabolim Airport is 50 km away. The air-conditioned rooms feature satellite TV, a personal safe and a wardrobe. A minibar is included. The en suite bathroom comes with hot and cold shower facilities. Specialising in seafood, Golden Net serves Indian, Chinese and Continental dishes. For a refreshing cocktail, mocktail or liquor, guests can head to Rodeo. Room service is provided. Keys Resort operates a gift shop. Service staff at the 24-hour front desk can assist with luggage storage, tour arrangement or car rental services. When would you like to stay at Keys Select Ronil Resort, Goa ? The air-conditioned rooms feature satellite TV, a personal safe and a wardrobe. A minibar is included. The en suite bathroom comes with hot and cold shower facilities. The air-conditioned rooms feature satellite TV, a personal safe and a wardrobe. A minibar is included. The en suite bathroom comes with hot and cold shower facilities.These larger rooms come with a seating area and a bathtub. Please note that the property mandatory gala dinner charges for stay on the 24th & 31st December 2018 to be paid at the hotel directly at the time of Check-In. Christmas (24th December 2018) – INR 4500 all inclusive per adult and INR 3000 all inclusive per child. New Year (31st December 2018) – INR 5500 all inclusive per adult & INR 3500 all inclusive per child. Each day we'll check prices and send you an email for your selected dates at Keys Select Ronil Resort, Goa. If you don't have specific dates but would like to check prices for say next weekend or say next month we can check the price too. Click to write a review and share your experience of Keys Select Ronil Resort, Goa with other travellers.